Got a new bike? Want to know the best places to ride it ? See below for a selection of Family, BMX, and MTB rides in Bristol and the surrounding area. 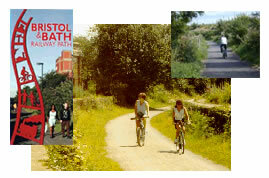 The Bristol and Bath Railway Path is a permissive off-highway route for pedestrians, cyclists and wheelchair users linking Bristol and Bath via Mangotsfield. It runs for 20 km along the, trackbed of the former Midland Railway. 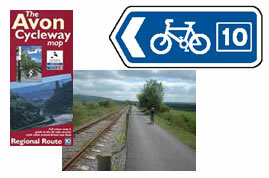 The first 6 km from Bristol attracts considerable commuter use, with the remainder being mainly used for leisure purposes. "The Avon Cycleway is a 85 mile circular route taking in many picturesque villages; numerous historic landmarks and a variety of splendid landscapes. It largely follows narrow and very lightly trafficked country lanes. It makes its way through largely peaceful pastural scenery, with the occasional spectacular view such as the Avon Gorge, Chew Valley and the Severn Estuary. There are 13 1inking routes which allow loop routes of 30 - 50 miles to be selected using Bristol or Bath as a base. Sections can be ridden at a leisurely pace, local and historic interest explored. 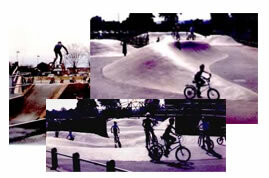 This state-of the art wheels park for skateboarders, in-line skaters and BMX riders was opened on August 17th 2002 at Hengrove Park in the south of Bristol. It is one of the most exciting parks built in England in recent years, and it's completely free! The park has recently been singled out for praise by the Bristol Civic Society for its contribution to city life. It has won an environmental award for attracting 65,000 visitors during the summer of 2003. What they call a wheels park. Mellow linking bowls with spectator bridge. Concrete tabletop/ bank and berm/ bank. Rough surface in between, but bowl bit's fun. Think "concrete wave" not "street". The UK’s brand new pioneering urban Mountain Biking Trail is a National First - a world-class urban mountain bike trail located on the edge of Bristol, within the Forest of Avon. 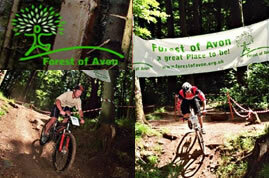 The 11 km circular route runs through Ashton Court Estate and Fifty Acre Wood in North Somerset. It was born from a need to provide a high quality trail to help protect environmentally sensitive local woodlands which are suffering due to the popularity of mountain biking. Our hope for the future is that mountain bikers will use the trail whilst respecting the wonderful natural environment and diverse wildlife in the forest of Avon. For more information a leaflet can be obtained by telephoning 0117 953 2141.